I've been on a runners high all week thanks to training well and feeling good in Big Sur. Yes, it was 21 miles and not the full marathon, but it was the hardest course I've done. I even consider it harder than the full marathon in Chicago. And you know what? I felt good. Finishing Big Sur was a huge accomplishment for me and I'm feeling ready for the marathon in Seattle. I have 7 weeks until Seattle RnR, and my training plan is to run long two more times. I read a few articles about hitting 20 miles and then doing a run near that length every third week to keep mileage up, and that's the plan I'm using. The long runs will be May 12 and June 2, likely about 20 miles each time. In between those weeks I'll run shorter, 10-12 mile runs, and I'm running a 10K race on May 27. I'm happy to have this time in between hitting 21 miles and the marathon to focus on quality runs and to rest as needed. Now for my dilemma. I've had my eye on the Columbus Marathon for a couple of years now, and it was going to be my goal marathon for 2013. Today, I found out that the 2012 course runs through the Ohio State Football Stadium. What! This news made me want to do it this October; who knows if the course will stay through the stadium next year? Plus, one of my college roommates will be running it as her first marathon and so many of my friends run one of the events every year. It would be a big reunion of running college friends and a route taking me through campus and down memory lane. I'd get to see my parents, who hardly ever get to come to races. Even thinking about it makes me crazy excited. 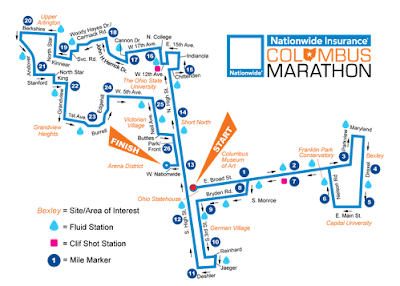 Course map from the Columbus Marathon website. My only hold up is that I only anticipated running one marathon this year, not two. My husband usually runs two and is happy to make Columbus his second for 2012. I haven't even run number two in Seattle yet. Can my body handle marathons number two and three in one year? I'm still not sure, I've never tried it, but at the moment I'm feeling strong and ready to take on the challenge. I can always play it safe and sign up for the half, but then I miss the run through OSU Stadium part of the course. I'm always the play it safe person, so maybe it's time to push myself a little. If something goes wrong, I could always drop back to the half at a later date. These statements even apply to the half - stop playing it safe and starting slow, try to push from the beginning of the race. I need to remember to push my limits, to let myself feel out of breath and uncomfortable sometimes. The final decision isn't made yet, but I'm leaning toward making this full marathon number three. The hotel is already booked for the weekend. Kevin is ready to sign up. The friends, family, OSU spirit and return to my home state are all calling to me. All I have to do is register. You are not doing full bore marathon training with speedwork and peaking. So I think you can do three instead of two. You just run slower if you feel your training is skimpy. The general run of thumb is two per year if they are all-out. The more marathons you run the better you will get at them (A shocker I know!) ! Lots of marathon maniacs run each race as the long run for the next! (but they are not runny any all-out). I would do it...you'll do great and it will help you build more endurance. The main issue is injuries. If you are running smoothly with no niggles then you are good to go. I am running it. SO EXCITED to run through the Shoe! I think I am going to try and find some OSU dry fit gear to run in! Congrats on your Big Sur 21 miler! What an interesting distance, I'd never heard of it before. If you want to do all three, I say go for it. I've done all three of my marathons within 6 months of each other (Nov 2011, Dec 2011 and May 2012) and I'm doing just fine, no injuries or burnout! I say sign up for the full and you can always drop to the half if you need to! You can do it Paulette! And it'll be so fun.. running through the stadium?? How fun is that? I am thinking about doing the half, especially if the half goes through the stadium too.